Associate Provost for Diversity and Inclusion and Adjunct Professor of Sociology at Rice University, where he chairs the Council on Diversity and Inclusion and serves on the Institutional Review Board. He came to Rice from the University of Notre Dame, where he served as Executive Assistant to the President, concurrent Associate Professor of Sociology and Director of the Center for Educational Opportunity. He also served as a research intern in the United States Senate. He continues to teach courses in ethnographic research methods. Dr. Smith served as a member of the Martin Luther King, Jr., Federal Holiday Commission in 1994 and Chair of the National Association of Presidential Assistants in Higher Education. Giving back to his alma maters, he served on the Bowie State University Board of Visitors and the Board of Directors for the Harvard Alumni Association. 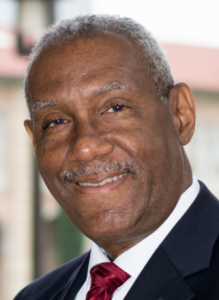 Dr. Smith was the Charter President of the American Association of Blacks in Higher Education. He served as a board member for the Texas Diversity Council. In Houston, he served as board chair of the Education Foundation of Harris County and board president of the Center for Health and Faith Initiatives located in the Texas Medical Center. He has served as board chair of the LifeGift Organ Donation Center and a member of the Houston Read Commission. He is a Life Member of Kappa Alpha Psi Fraternity, Inc.
Born in Washington, D.C., he holds a B.A. in Anthropology and Sociology from Bowie State University and a M.P.A. from Indiana University. Dr. Smith holds an Ed.D. from the Harvard Graduate School of Education, where he was elected to the Harvard Educational Review and served as a teaching fellow.